When it rains, it pours. Literally. 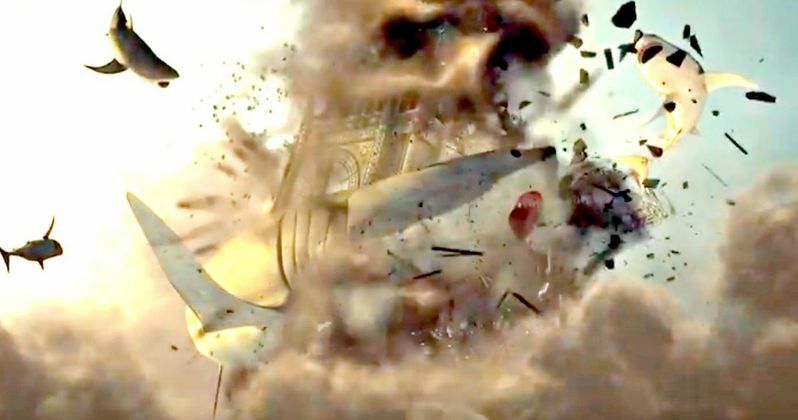 The first sneak peek teaser trailer for Sharknado 5: Global Swarming has arrived, and it's a disaster. Quite literally. The short but sweet twenty-second clip shows sharks smashing into landmarks all over the word. And as the tagline says, you know where this is going. So grab that passport and get gas for your chainsaw, because Sharknado is going global! The movie event of the summer is happening this August on Syfy. And today we get our first cheeky look at another fun installment in what has become a seasonal tradition. Part 5 of this never-ending saga is going to hit our shores on Sunday, August 6 at 8/7c. And to coincide with the title, the latest Sharknado adventure will air in more than 100 countries. As previously reported by Syfy, the title Sharknado 5: Global Swarming and the film's official tagline, "Make America Bait Again!," are the result of a fan-sourced social initiative that launched this past April. SYFY invited Facebook users to submit their most creative and outrageous ideas via an interactive bot, and this, sons and daughters, is the result. The mission gets personal for Fin Shepard (Ian Ziering) and his bionic wife, April (Tara Reid) in Sharknado 5, when their young son gets trapped in a traveling 'nado and transported all over the world. From London to Rio, Tokyo, Rome, Amsterdam and beyond, our globetrotting heroes will seek assistance from a highly-skilled squad of royals, scholars and Olympians, enlisting famous faces from news, entertainment, and sports in their most epic battle yet. What would a Sharknado movie be without cameos? Don't worry, cause this movie's got them! Fabio (Model) stars as the Pope and Tony Hawk (Professional skateboarder) is a masterful weapons operative strategist. It doesn't end there. Clay Aiken (Musician) is Llewelyn, a cutting edge technology genius and Olivia Newton-John (Musician) and daughter Chloe Lattanzi put in a wink-and-nod appearance as Orion and Electra, two brilliant scientists who help defend Australia from a looming Sharknado. Additional Sharknado cameos include rocker Bret Michaels as a visiting artist that gets trapped in the storm, Margaret Cho (Comedian) as a fussy bride whose honeymoon is interrupted by sharks, Charo (Musician, Comedian) as The Queen of England, Gilbert Gottfried (Comedian) as storm chaser Ron McDonald and Today hosts Al Roker, Kathie Lee Gifford and Hoda Kotb as themselves. The Sharknado 5 cameo goes on for an eternity, and also includes Olympic diving medalists Greg Louganis as Zico, a high-end art thief, Tom Daley as himself and Olympic freeskiing medalist Gus Kenworthy and NBC News investigative correspondent Jeff Rossen as themselves. Porsha Williams (The Real Housewives of Atlanta) plays Andromeda, an archeologist and member of the elite "Sharknado Sisterhood," while Tiffany "New York" Pollard (Flavor of Love) makes an appearance as Vega, a Brazilian black market artifacts dealer. This first wave of cameos is rounded out by Chris Kattan (Saturday Night Live) as The Prime Minister of England, Cat Greenleaf (Talk Stoop) and Dan Fogler (Fantastic Beasts and Where to Find Them) as themselves and Ross Mullan (Game of Thrones White Walker) as Dr. Wobbegon, a scientist who has made breakthroughs in meteorological studies to track Sharknado storms. Also reprising their roles from previous installments are Cassie Scerbo, Masiela Lusha and Cody Linley. Sharknado 5: Global Swarming, a production of The Asylum, is directed by Anthony C. Ferrante based on an original screenplay by Scotty Mullen. Last year, Thunder Levin, who wrote the first four Sharknado movies, revealed in an interview that he had submitted ideas for the fifth, sixth and seventh movies to The Asylum, but it seems the production company went in another direction, bringing Scotty Mullen aboard, who has written movies such as Zoombies and has served as the casting director on Sharknado: The Fourth Awakens. While we await the storm in our Sark shelters, take a look at the hard hitting teaser for Sharknado 5. Its going to be a global shark storm.